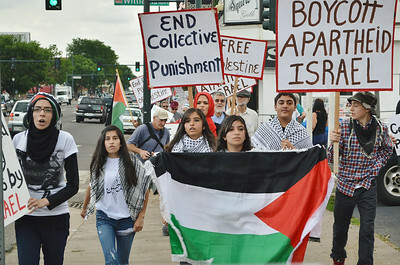 Palestinians and supporters march in Denver to protest Israeli attacks in Gaza. Includes images of protest marchers with signs and Palestinian flags, some marchers wearing Keffiyehs and taditional headscarves. 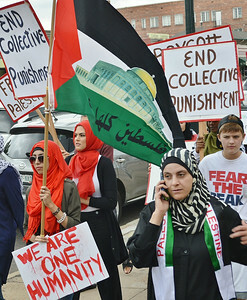 Group of women marching in Palestinian protest, some wearing headscarves and carrying signs, one woman carrying a camera. 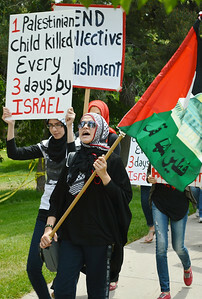 Group of women marching in Palestinian protest, some wearing headscarves and carrying signs, one carrying a camera. 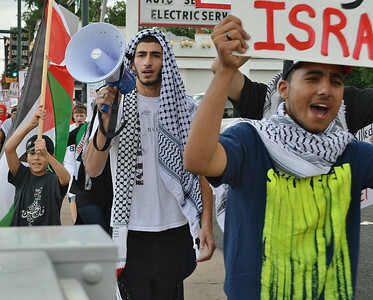 Young man wearing Keffiyeh on head, carrying bullhorn, young boy carrying Palestinian flag behind him, other marcher in front of them. 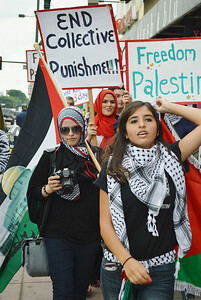 Young Palestinian man wearing traditional Keffiyeh (scarf), talking on cell phone, flashing peace sign with hand, carrying freedom for Palestine sign, other protest marchers behind him. Muslim woman wearing headscarf shouts while marching, holding Palestinian flag, other women marching beside her. 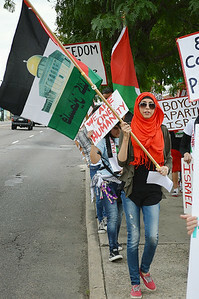 Young woman wearing red headscarf, carrying Palestinian flag with picture of mosque on it, other marchers with signs and flags behind her. 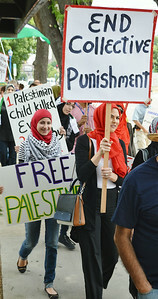 Young Muslim woman smiling, marching in Palestinian protest holding sign about collective punishment. 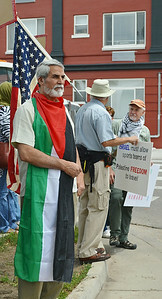 Man with white hair and beard, wearing Palestinian flag, American flag in the background. Young boy marching in Palestinian protest, other demonstrators behind him. Young boy marching in protest, carrying Palestinian flag, other demonstrators with signs behind him. 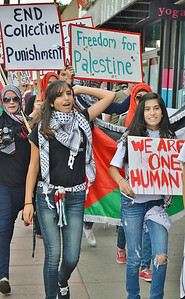 Two young Muslim women marching with signs at Palestinian protest. 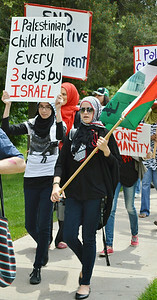 Group of Muslim women wearing headscarfs marching with signs, one carries Palestinian flag with picture of Mosque on it. 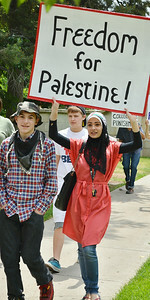 Young Muslim girl wearing headscarf, raises sign about Palestine above head, other marchers next to her. Group of marchers at Palestinian protest carry signs and flags, some women wearing headscarfs. 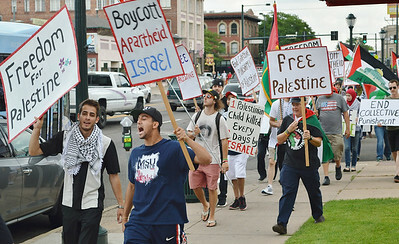 Young man holding sign shouts while marching in Palestinian protest, large group of demonstrators with flags and signs behind him. 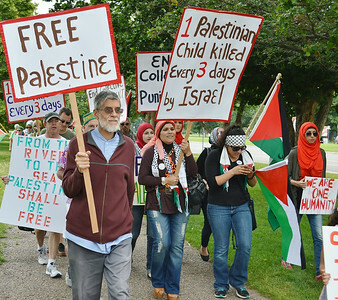 Young girl carrying Palestinian flag, other marchers behind her with signs and flags. 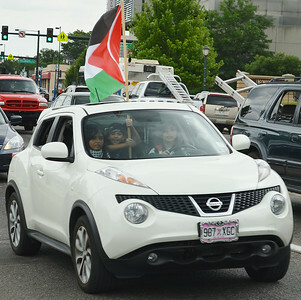 Young boy smiling, waving Palestinian flag out of top hatch of car in traffic, two young women in car with him.